Composite floor decking provides a structurally strong and efficient flooring solution suitable for a diverse range of building types. 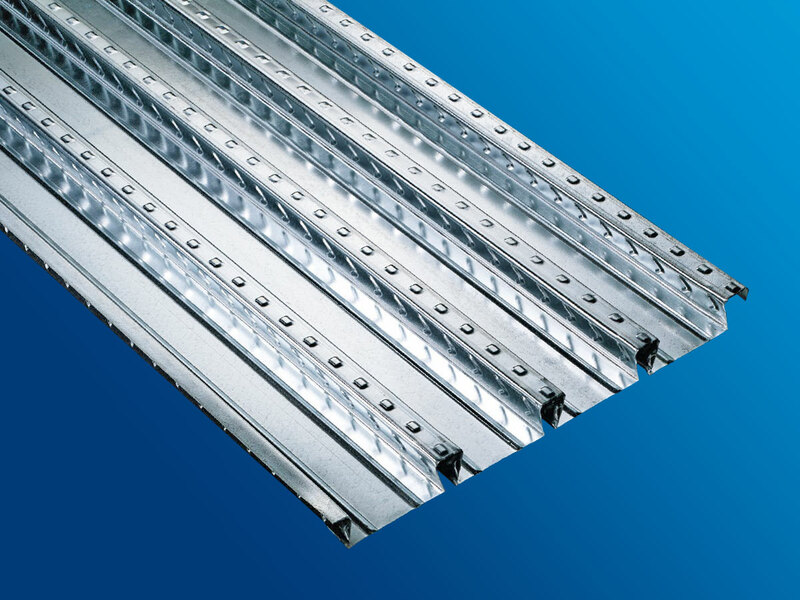 It is most commonly used in commercial multi-storey construction where structural strength, speed and cost are key requirements for the builds. A composite metal floor consists of a concrete slab cast onto a standard metal deck (shallow) or specialist metal deck (deep). Simply put, concrete is good for compression and steel is good for tension. The combined (or composite) strength reduces the overall weight bearing on the supporting structure including the foundations, which results in a lightweight building with long clear spans. Here at Composite Profiles, we are experts in composite floor profiles – the clue is in our name! We offer Standard Decks to span 2.5 to 4.5 meters unpropped and Specialist Long-Spanning Deep Decks that span up to 6m unpropped and 9m propped. Nestable. The simple trapezoidal shape neatly fits one profile into another, allowing more square metres per bundle. Low transport cost. Results in reduced environmental impact and in less crane time. Combined trapezoidal and re-entrant 80mm composite profile with long span capability. Versatile, Combined profile allows easy service attachment, with trapezoidal spanning ability. Reduce the number of secondary beams,. Strong long span composite profile for non-composite beams. Long span strength reduces or eliminates temporary propping. Nestable profile gives low transport and handling costs. We deliver and install standard decking fast, which presents great advantages! With 1000m2 per load delivery capability and an install rate of 400m2 per team per day, we prepare your build for onwards trades in far less time than if you were to use precast concrete planks. Fire resistance slabs means there’s no need to apply time-consuming and costly fire retardants to the soffit. The sum of time saved also helps to maintain the programme schedule and offers overall savings in install costs. Furthermore, transport congestion and crane time is reduced when using steel decking resulting in a much lower environmental footprint for the build project. Finally, the ‘cradle to grave’ traceability of all Tata Steel components maximises points for BREEAM requirements without the necessary need for alternative sustainable systems such as rain collection or solar panels. All Tata Steel decks hold the BES 6001 Responsible Sourcing standard, which ensures we are all working together to build the future safely and sustainably. The original deep ultra long span composite profile introduced for the first Slimflor systems. Efficient. Cross stiffener technology and deep profile shape provides a very efficient metal deck and composite slab. Especially suited to bear on the extended lower flange of a steel beam, can also be used on the top flange. The speed of construction for large builds and the simplification of specialist builds with complex requirements are huge advantages of using steel in construction. We specify and install specialist deep decks to achieve long spanning capabilities – up to 6m unpropped and 9m propped. Typical examples are non-residential builds such as hospitals, commercial units and industrial warehouses. For complex specialist builds such as listed buildings, we can use integrated beams into the deep deck to reduce floor height, whilst still adhering to planning requirements and retaining the listed facade. As with all our work, the clever bit is behind the scenes, integral to a building’s existence but often unseen to the end user. By using specialist deep decks, we can secure services and pipework in shallow voids to reduce the overall service zone requirements. This height saving enables an extra floor to be added without increasing the overall height of the building thus maximising usable space and rental revenue. Excellent fire ratings and low vibration results are further benefits of steel construction that are increasing requirements in the modern world. For example, warehouses using rolling robotics, mega-sheds for distribution and storage, car parks and transportation hubs. As part of BBC One DIY SOS: Grenfell Special, our installation team worked hand in hand with a multitude of other trades to install 75m2 of single span floor decking to the first floor of the new Dale Youth Boxing Club. A team of 2 worked 10 hours solid to do this for the community of Grenfell Tower following the devastating fire in June 2017.